Figure 5-5. 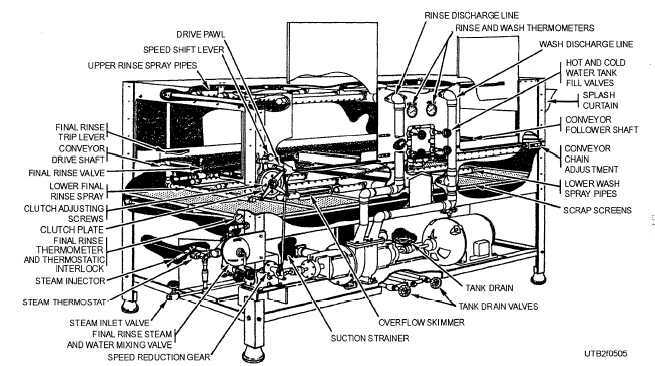 - A cutaway view of a double-tank automatic dishwasher. grades and viscosities of the oil used, the levels at which the oil is to be maintained, and the places to be oiled. All damaged or missing lubrication fittings should be replaced. The grease cups on the drive end, connecting rod, and the rinse lever should be turned once each quarter and be refilled when empty. Also, the revolving wash arms and valve stems should have a few drops of light oil applied to them about once each quarter. Be sure to turn off the power before lubricating the equipment. Repair or replace the torn or worn curtains. Straighten the warped pans so they stay flat in the machine. Replace the packing with new material of the same type and size. Do not overpack the packing gland because this condition causes binding of the shaft. Replace the broken or damaged thermometers. Check the accuracy of the thermometer by measuring the water temperature with a high-grade thermometer and comparing results with a thermostat setting. The thermostat should be set for a wash water temperature between 138F to 145F and rinse water for a temperature of 180F or above. Defective conveyors should be properly adjusted or replaced. Check the nylon covering of steel parts and replace the coverings when they are worn or torn. The inspection doors of wash and rinse compartments should be kept tight at all times. Straighten or replace bent or loose doors. Check the chains and pulleys of counterbalanced doors. Apply oil regularly to moving parts. Check the dish racks for bent or warped surfaces and replace broken parts.